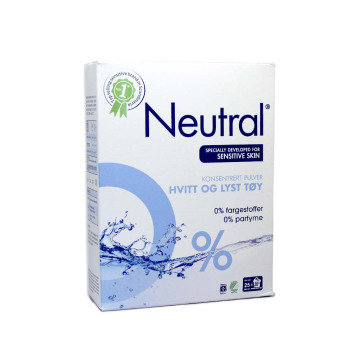 All kinds of detergents and softeners in different formats and sizes from Norway, Holland and other countries. You can choose between the exclusive brands like Neutral (without parabens) or Omo, Lenor. 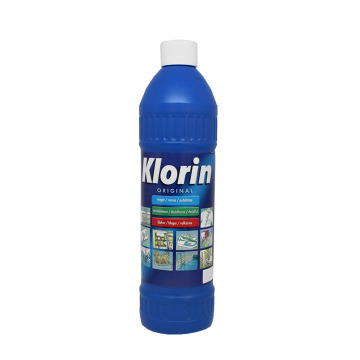 ENKlorin is best for cleaning, bleaching and disinfecting. SVKlorin är bäst för rengöring, blekning och desinficering. ENAriel laundry detergent capsules. 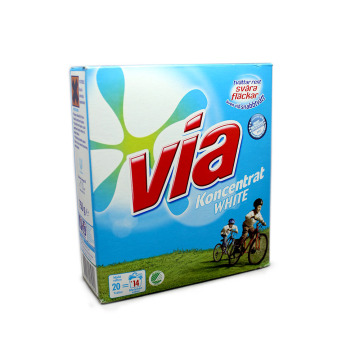 The pack contains 12 capsules for 12 washes. 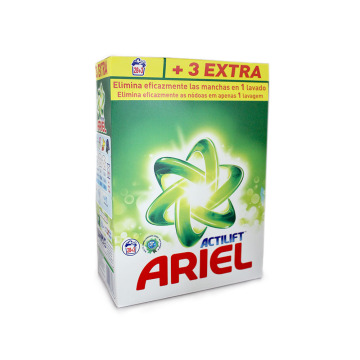 The innovative Ariel wash capsule film dissolves completely in contact with water to release the powerful technologies that deal with a wide range of stains. 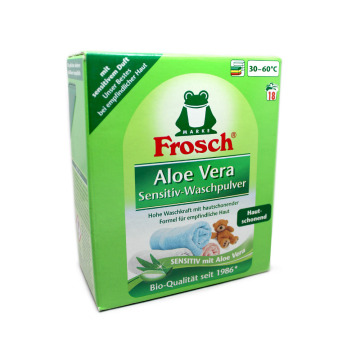 Excellent cleaning even at temperatures below 30 ° C.
ENDeveloped especially for sensitive skin with 0% perfume and 0% dye. Removes stains effectively. 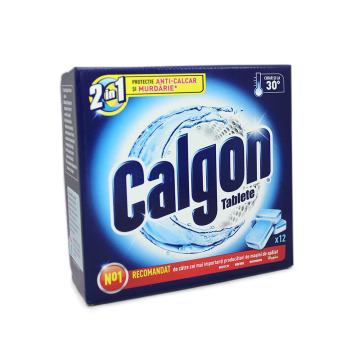 Suitable for washing at high temperatures. NLSpeciaal ontwikkeld voor de gevoelige huid met 0% 0% parfum en kleurstof. Verwijdert vlekken effectief. Geschikt voor het wassen bij hoge temperaturen. ENPowder detergent for strong colors and sensitive skins, designed to minimize the risk of allergic skin reactions. Without perfumes or dyes, tested dermatologically. NOVaskepulver for sterke farger og sensitiv hud, designet for å minimere risikoen for allergiske hudreaksjoner. Ingen parfyme eller fargestoffer , jeg dermatologisk testet. 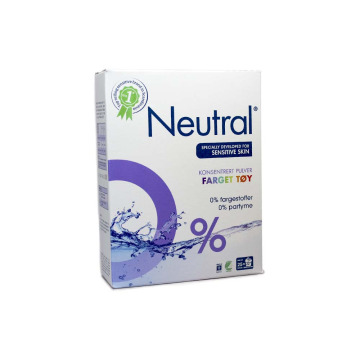 ENNeutral powder detergent for colored clothing that has enzymes to effectively clean clothes and keep the colors bright, especially designed for sensitive skin. SVNeutral tvättmedel pulver färgade kläder som har enzymer att effektivt rena kläder och hålla ljusa färger, särskilt utformade för känslig hud. ENNeutrex Oxy 5 gel is a detergent for colored clothing. 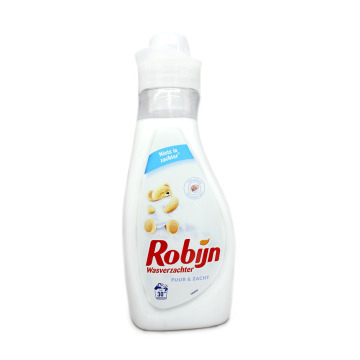 Removes stains, designs colors, does not damage clothing and has a hygienic protection effect. 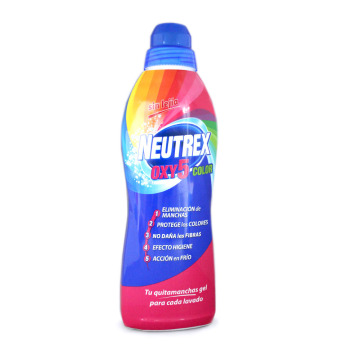 ESNeutrex Oxy 5 gel es un detergente para la ropa de color. Quita las manchas, progete los colores, no daña la ropa y tiene un efecto protección de higiene. 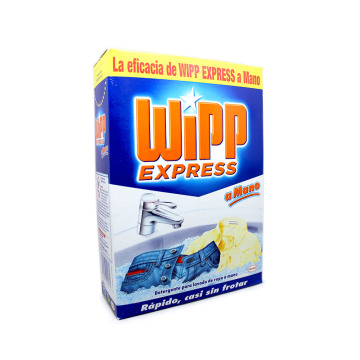 ENWipp Express laundry detergent for hand washing. It has a quick action detergene so you will not need to rub a lot. Henkel Quality. ESDetergente en polvo Wipp Express para el lavado de la ropa a mano. Es un detergene de rápida acción así que no necesitarás frotar mucho. Calidad Henkel. 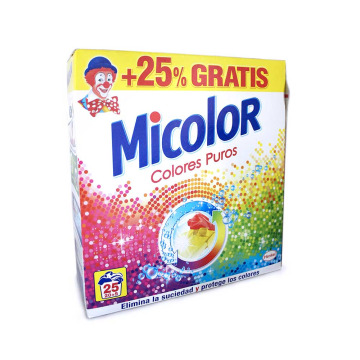 ENMicolor Colores Puros is a powder detergent for washing by hand or in a washing machine. 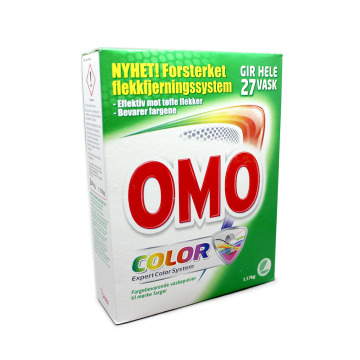 Protects the colors of your clothes and removes dirt. ESMicolor Colores Puros es un detergente en polvo para lavar a mano o en lavadora. Protege los colores de tu ropa y elimina la suciedad. ENGel detergent for colored clothing. 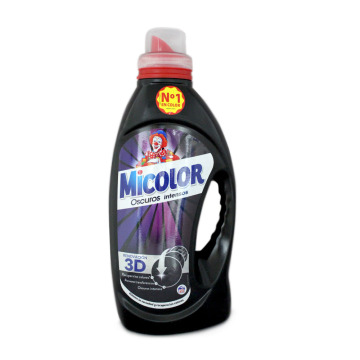 Micolor Colores Vivos removes dirt, recovers the color of your clothes and leaves it shiny. ESGel detergente para la ropa de color. 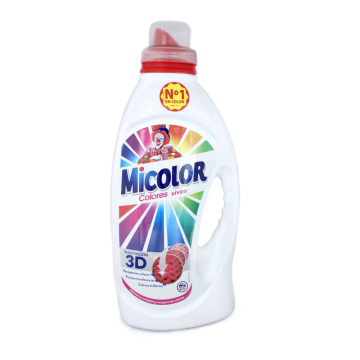 Micolor Colores Vivos elimina la suciedad, recupera el color de tu ropa y la deja brillante. ENLaundry soap to wash clothes by hand. It is ideal for removing stains from clothing. Its components are soap and citrus. ESJabón para lavar la ropa a mano. 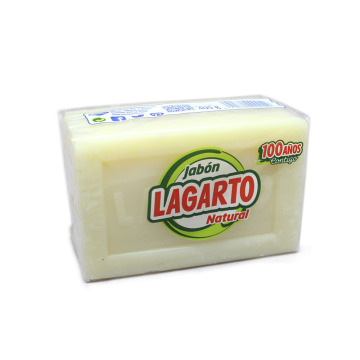 Esta es la pastilla de jabón de toda la vida, el que se usaba antes para frotar bien la ropa. Es ideal para sacar las manchas de la ropa. Sus componentes son jabón y cítricos. ENGel detergent for dark colored clothing. Micolor Colores Vivos removes dirt, recovers the color of your dark colored clothes and leaves it shiny as the first day. ESGel detergente para la ropa de color oscura. Micolor Colores Vivos elimina la suciedad, recupera el color de tu ropa oscura y la deja brillante como el primer día. ENSuper absorbent wipes for washing machine. 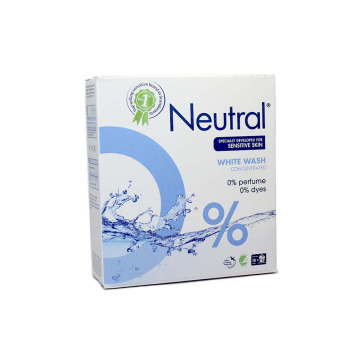 Protect the color of your clothes with these wipes that absorb the color that comes off the clothes during washing. ESToallitas super absorbentes para la lavadora. Protege el color de tu ropa con estas toallitas que absorben el color que se desprende de la ropa durante el lavado. 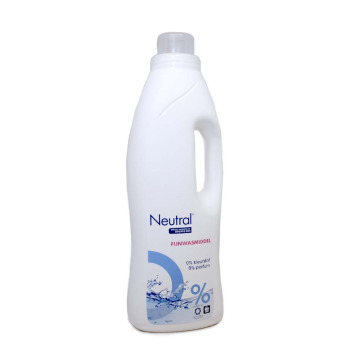 ENLiquid detergent for washing machine. 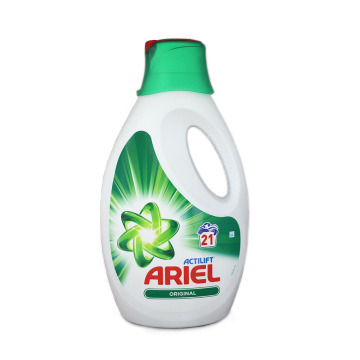 Wash your clothes with Ariel and leave your clothes clean and fresh. ESDetergente líquido para la lavadora. Lava tus prendas con Ariel y deja tu ropa limpia y fresca. 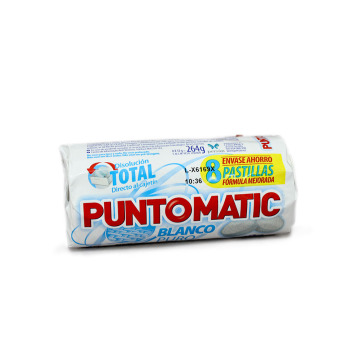 ENPunto Matic detergent tablets for white clohtes. Just for washing mashine use. The pack contains 4 individual bags that dissolve directly in the box. 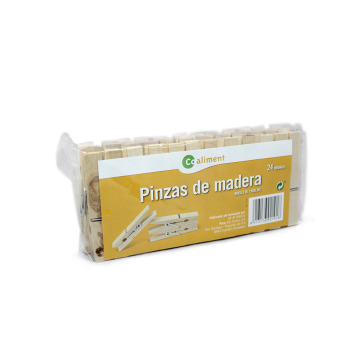 ESPastillas de Punto Matic para el lavado de ropa blanca a máquina. El pack contiene 4 bolsas individuales que se disuelven directamente en el cajetín. 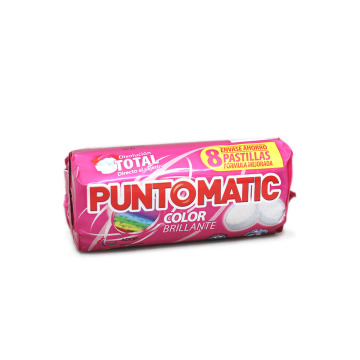 ENPunto Matic detergent tablets for colored clohtes. Just for washing mashine use. The pack contains 4 individual bags that dissolve directly in the box. ESPastillas de de detergente Punto Matic para el lavado de ropa de color a máquina. El pack contiene 4 bolsas individuales que se disuelven directamente en el cajetín. 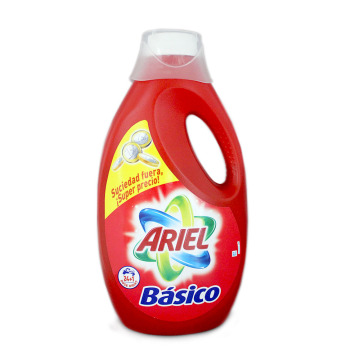 ENTry to wash your clohtes with Ariel's Basic Laundry Detergent. It has an approximate capacity for 24 washes. 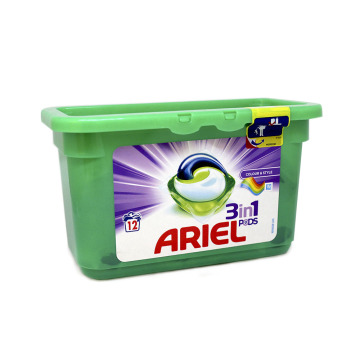 ESPrueba a lavar tu ropa con el detergente Básico para lavadora de Ariel. Tiene una capacidad aproximada para 24 lavados. 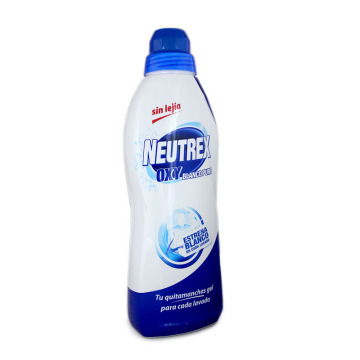 ENDetergent powder to wash your clothes. Its active enzymes eliminate all stains, even the most difficult to remove. 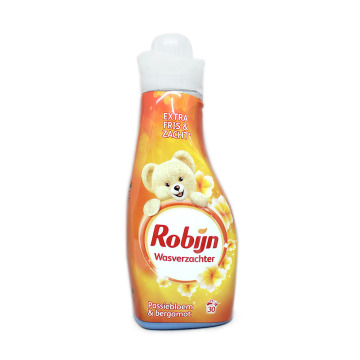 NLWasmiddel poeder om je kleding te wassen. De actieve enzymen elimineren alle vlekken, zelfs de moeilijkste te verwijderen. ENNeutrex Oxy Blanco Puro gel is a laundry detergent. 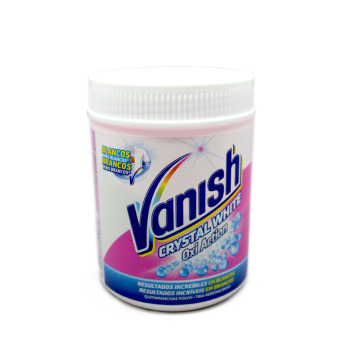 It removes stains, does not damage clothes and leaves the white of your clothes bright for a long time. 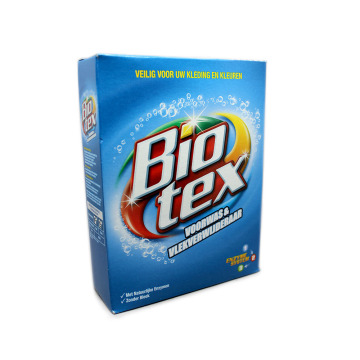 ESNeutrex Oxy Blanco Puro gel es un detergente para la ropa blanca. Quita las manchas, no daña la ropa y deja el blanco de tu ropa brillante por mucho tiempo. 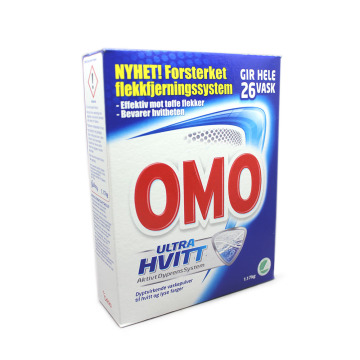 ENLeave your clothes white and shiny with this powder detergent from Sweden. The white of your clothes is now whiter. SVLämna dina kläder vita och glänsande med detta pulvermedel från Sverige. Den vita av dina kläder är nu vitare. 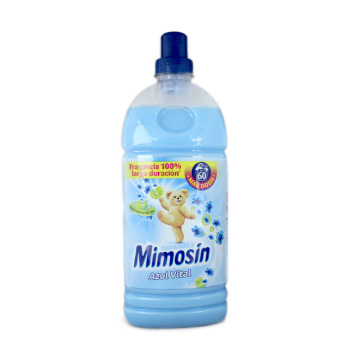 ENMimosín concentrated conditioner for clothing. Give your clothes softness and freshness with its citrus fragrance. This clothes conditioner has a capacity of 60 doses. ESSuavizante concentrado para la ropa de Mimosín. Dale suavidad y frescura a tu ropa con su fragancia a cítricos. Este suavizante tiene una capacidad de 60 dosis. 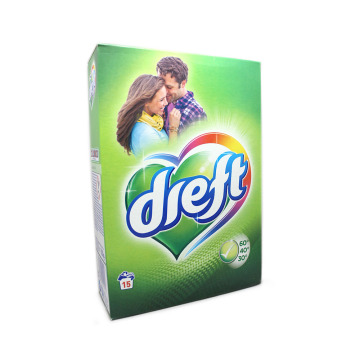 ENTry this Dutch detergent for clothes. 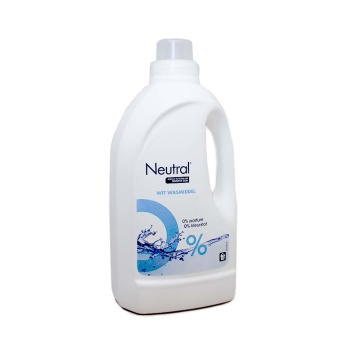 With this laundry detergent the colors will appear brighter and they will be protected for longer. NLProbeer dit Nederlandse wasmiddel voor kleding. Met deze wasmiddel worden de kleuren helderder en worden ze langer beschermd. ENGel detergent for washing your clothes. 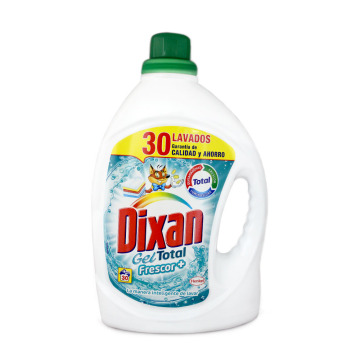 Dixan removes stains easily, brings freshness to your clothing and gives it brightness. It has an approximate capacity for 30 washes. ESGel detergente para el lavado de tu ropa. 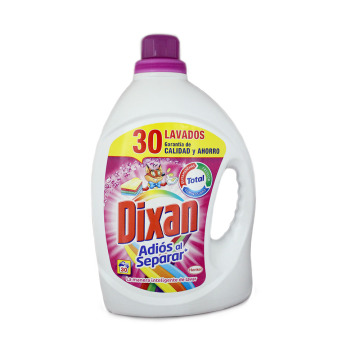 Dixan elimina las manchas con facilidad, aporta frescor a tu ropa y le da luminosidad. Tiene una capacidad aproximada para 30 lavados. ENGel detergent for washing your clothes. 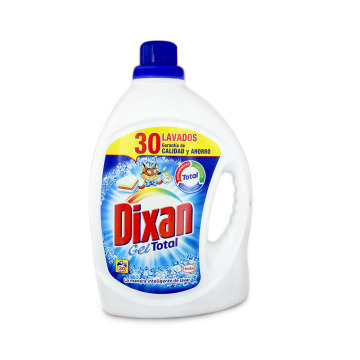 Dixan leaves your clothes clean and without stains. It has an approximate capacity for 30 washes. ESGel detergente para el lavado de tu ropa. Dixan deja tu ropa limpia y libre de manchas. Tiene una capacidad aproximada para 30 lavados. ENPack of 24 plastic tweezers for clothes. Its stainless steel spring offers a longer life than many brands. 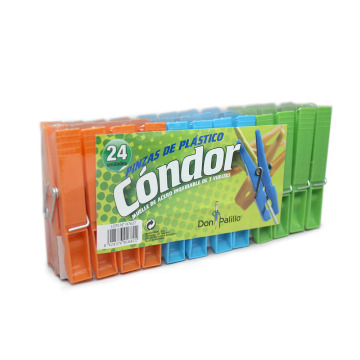 ESPack de 24 pinzas de plástico para tender la ropa. Su muelle de acero inoxidable les ofrece una duración superior a muchas marcas. ENTweezers for clothes and wooden dock with 7 turns. The pack contains 24 units. ESPinzas para tender la ropa de madera y con muelle de 7 vueltas. El pack contiene 24 unidades.